In a large container, combine chow-chow ingredients, cabbage, peppers, onions and tomatoes (raw vegetables should equal 2½ to 3 quarts). Mix vegetables with ½ cup of salt, cover them, and let them stand for 4–12 hours. Drain well. Pour cola into small pot. Add sausages to the pot. Bring to a boil. As soon as the cola turns clear remove the sausages from the liquid (about 4–5 minutes). Preheat charcoal grill to 400°F. Place bratwursts on hot grate over direct heat for 2 minutes on each side. 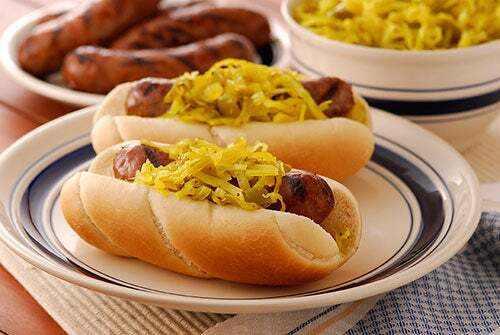 Remove bratwurst from grill and place on hotdog bun. Top with a generous helping of chow-chow.